Rupee Doing a Bungee Jump – Time to bounce back? The Rupee has breached all predicted floors in the past few days and has fallen like a rock. It touched an all time low against the US dollar yesterday and traded at 68.78 loosing over 4% in a single day. The fall has been particularly sharp in this week as the rupee lost over 8% in just 3 days. Culprit in this case was the passage of Food Security Bill. The Rupee was trading at 63.50 in 23 Aug (Friday) and with passing of Food Security Bill on Monday (26th Aug) sharply trended towards the 66 mark. Food Security Bill (FSB) with all its right intentions of providing for the poor is not something the country can afford. The current account deficit has ballooned to over 4% of GDP and the FSB is estimated to cost 3.5% of GDP. The looming elections in the coming year has got the ruling government to go after populist measures than trying to take some hard steps and get the economy back on track. As I write this piece the Reserve Bank of India has come out and declared that it would be selling USD to Oil Corporations directly and this should provide some relief to the falling rupee. I would not be surprised that if the Rupee opens sharply higher and recovers all the losses of yesterday. But this relief rally would be short-lived as the fundamentals behind the fall have not changed. RBI’s step can reduce the volatility and demand in the Forex market but does not change the fact that the country does not have the money its spending. On the flip side the fall of the Rupee might be a blessing in disguise for the economy. Exports from India become competitive and would bring in much-needed business to India. Where other countries like Japan have been deliberately trying to weaken their currency to improve exports India has this golden opportunity presented to it. Now does the government use it to the countries advantage or squander it away needs to be seen. As an immediate measure my suggestion would be to launch a scheme to provide amnesty on bringing black money stashed abroad to India and investing them in Rupee denominated Bonds. The size of the black money in India is estimated to be 30% of the GDP as per World bank estimates. Of this 30% at least half is stashed overseas (some figures report higher numbers). 1. Bring in the black money tax-free for investing in non-interest bearing Rupee bonds. The money would be locked in for 3 years. 2. Bring in the black money by paying a 14% tax and investing in 5% interesting bearing Rupee denominated bonds. With India’s Current Account deficit pegged at 4.9% of GDP and Black money overseas of at least 15% of GDP, this scheme could single-handedly support the falling Indian Rupee and bolster the Indian Government’s coffers. The instant demand for Rupee would push the currency up and bring in long-term capital to the country. Government could go a step ahead and allow the Bond Holders to borrow interest free against the Bonds if Investing Food or Energy Sector. For the longer term, investments need to be made towards achieving food self-sufficiency and improving energy sector. The money collected through the amnesty scheme could be used to build storage facilities and investing in alternative sources of energy. The Rupee has breached all predicted floors in the past few days and has been falling as a rock. How much Gold do Central Banks Hold? Chanced upon this interesting set of data from World Gold Council on the Gold reserves each country has and the percentage allocation as a part of the Total Reserves. 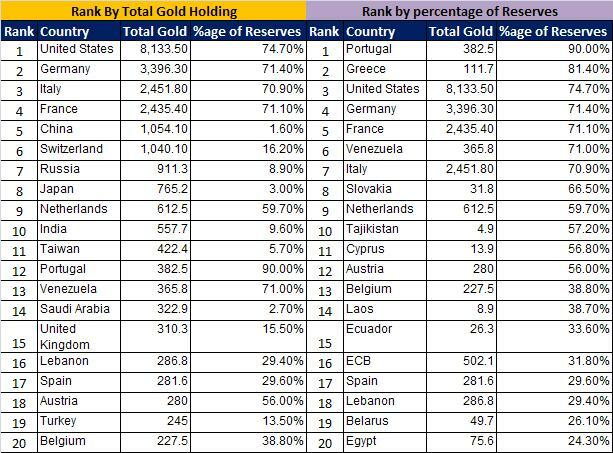 It was surprising to see that Portugal has 90% of its reserves held in Gold whereas China has only 1.6% even though the total gold holding is upwards of 1054 tons and ranks 5th on the table. Japan also has a low percentage of 3% and ranks 8th on the table with gold reserves of 765 tons. One should note that China and Japan own US debt to the tune of 1.2 trillion and 912 billion USD respectively. At current prices the value of Chinese and Japanese Gold is 55 and 40 billion dollars and the US treasury bills make up 35% and 54% of their Reserves. The high US Gold Holding could be one reason why China and Japan have not increased their exposure to Gold as they would feel they are owning Gold indirectly by owning US securities. In case of a US default the debt could be paid by using Gold reserves. In the recent months the Chinese purchase of Gold has increased many fold and it could be a attempt on part of the government to shore up Gold reserves to thwart any financial crisis. 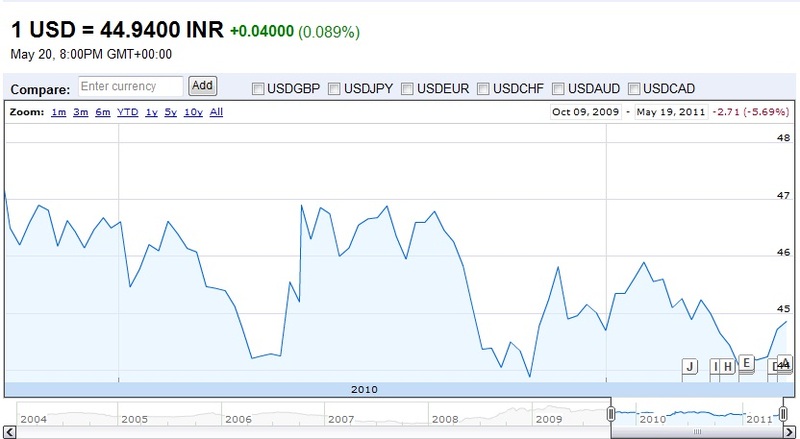 USD INR Carry – have you thought about it? Forex trading and carry trade go hand in hand. A few years back it was USD against JPY, then the turn came for AUD against USD and recently people have been talking about EUR against USD on the prospects of US interests remaining low and Euro zone increasing rates to reign in inflation. The key in all scenarios being large interest rate differentials that allow cheap borrowing in one currency and invetsing in the other. The usual trend is that the currency with the higher interest yield slowly gains against the lower interest rate currency. AUD-USD moved from lows of 0.80 to 1.05 range gaining whopping 25%, the theme was similar for USD-JPY or EUR-USD. Now given that the interest rate differential is 7% and how other currencies have gained with the carry trade there is no reason why something similar would not happen with USD – INR. Indian Rupee should be strengthening against USD in line with how other currencies have performed. Yes INR is a currency of a developing country and uses USD to pay for the Oil that it imports but that still does not completely negate the interest rate differential. Using a simple calculation 1USD invested in India @ Rs.45 would grow to Rs48.37 in one year and seeing the trend of USD-INR fluctuating in a close 3% range there is every reason to enter the USD-INR carry trade.